If you’ve only experienced bourbon in a glass, you’re missing out big time. Of course bourbon is tasty sipped on its own or mixed into a cocktail, whichever shape glass you use. But “America’s Native Spirit” also serves as a welcome ingredient in a wide range of dishes from appetizers to entrées to desserts. Taste your way along The B-Line in Northern Kentucky and discover how the area’s best chefs are putting bourbon to delicious use. 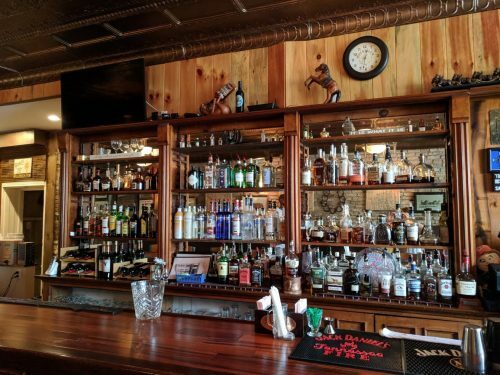 The B-Line adds a new twist to Kentucky bourbon country as it showcases four snazzy restaurants in Downtown Covington and the surrounding hills of Northern Kentucky, plus five cool bourbon-centric bars and three distilleries that are also on the Kentucky Bourbon Trail Craft Tour. The B-Line makes it easy to plan a trip whether you come for a day, weekend or longer: Hit up the participating stops for a fun, flexible itinerary. Stick close to the city or take a day trip to Maysville. Buzz to each stop during one visit or use The B-Line as an excuse to keep coming back. Focus solely on bourbon or dip into rye whiskey, too. The choice is yours. Best of all, it’s not possible to make a mistake unless you miss out on The B-Line altogether. Grab a free passport at any participating stop on The B-Line and get ready to “find your sipping point” in Northern Kentucky, which was designated an “Official Gateway to the Kentucky Bourbon Trail” by the Kentucky Distillers’ Association in 2017. In order to earn a spot on The B-Line, restaurants must maintain a collection of at least 50 different types of bourbon on its bar menu—though you’ll also see bourbon as an ingredient in several dishes on the food menu, too, a tasty way to enhance your bourbon enjoyment. Bouquet Restaurant is an upscale farm-to-table bistro located in Covington’s MainStrasse Village. The cozy dining room is ideal for a tête-à-tête meal since tables aren’t packed together and attentive servers keep the delicious drinks and dishes flowing without unnecessary interruptions. As one of the area’s first restaurants to embrace local and sustainable farming, the menu changes frequently in order to showcase the season’s best produce and products. 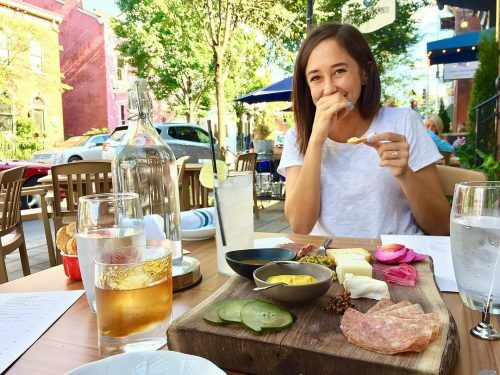 Don’t miss “The Motherboard,” a loaded platter of four cured meats, five cheeses and a plethora of accompaniments including pickled produce, jams and nutty nibbles. That alone could satisfy light eaters, but it would be a shame to skip any of the creative entrées such as the duck with blueberries and field peas or grass-fed waygu burger topped with melted onion, sauerkraut, pimento cheese and pickles. Brussels sprouts with country ham and blue cheese prove that side dishes can impress as well as any main. Save room for desserts like the bourbon vanilla arancini with strawberries, cream and white chocolate. Sunday brunch presents indulgences like confit duck hash as well as guilt-less treats like yogurt and oats. 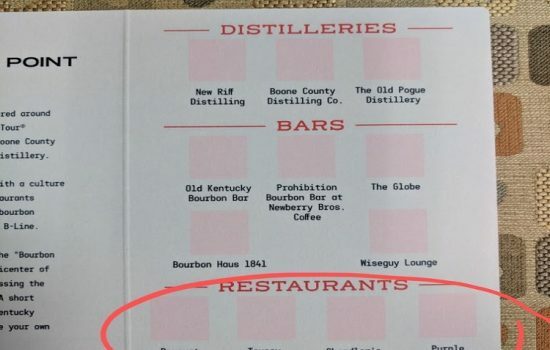 The bar menu features an extensive list of bourbons plus fine wines and cocktails like the “Smoked Old Fashioned” with bourbon, sorghum, salt, black walnut bitters and hickory-smoked simple syrup. Monthly four-course tasting dinners with set menus offer a chance to taste more, decide less. 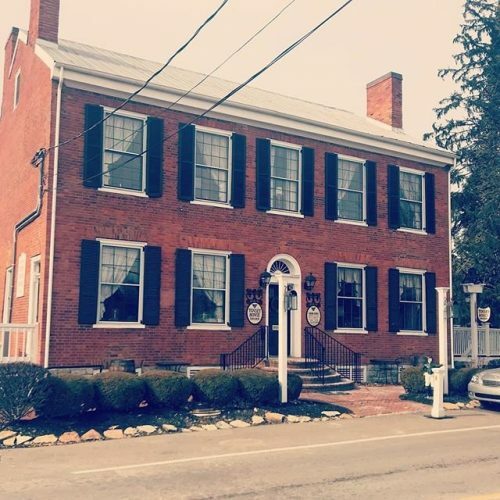 Chandler’s on Market in Maysville is one stop on The B-Line with two distinct vibes, since the restaurant occupies one suite in the building with the bar in another next door. While the long bar dominates its room and encourages guests to rub elbows at the bar while sipping a whiskey or cocktail, the main dining room is more spacious and offers different floor levels that themselves have different lighting levels to suit many moods. 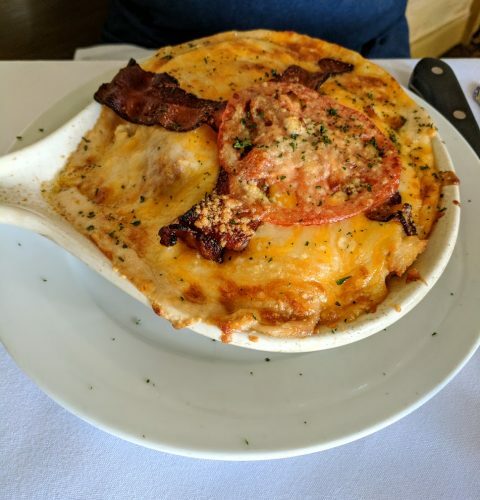 The menu showcases traditional Southern favorites like barbecue chicken or pork (which are smothered in Chandler’s original secret sauce) as well as regional favorites like the Kentucky Hot Brown that tops toasted ciabatta bread with turkey, mornay sauce, cheese, bacon and tomato. When in season don’t miss the fried tomatoes appetizer, done right and simply presented. With its straightforward classic dishes and casual approach, this eatery is The B-Line’s most down-home, laid-back dining option. Bonus: Though it’s not an official stop on The B-Line, while you’re in Maysville to check out Chandler’s on Market stop by the Kentucky Gateway Museum Center. The Bourbon Walk exhibit showcases “where bourbon began its journey,” detailing how bourbon was shipped from Maysville into the rest of the country along the river and Maysville Road—a story that begins in 1784! Construction is underway for a new Old Pogue Distillery tasting experience on the first floor of The Limestone Building adjacent to the museum. Many historic Pogue family and bourbon industry artifacts will be on display to share Maysville’s and Mason County’s distilling history. 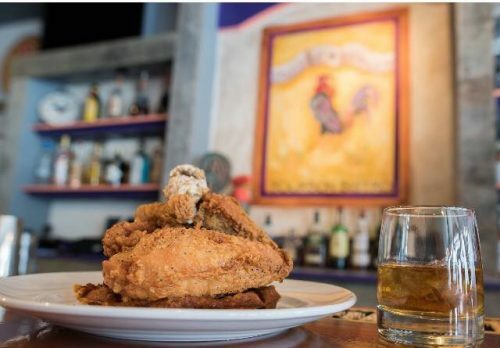 Purple Poulet sets a bright and cheery mood in Dayton from the moment you step into the dining room with its royal-hued décor, colorful bourbon-themed paintings, and friendly staff members. The “Southern Bourbon Bistro” menu merges Southern, Kentucky and Creole cuisines with Chef/Owner Rich Zumwalde’s creative twists. With so many mouth-watering temptations to choose among it can be tough to make a decision about what to order, but relax, you can’t make a mistake. Fried chicken is what this chef is best-known for, and you can get four pieces with mashed potatoes drenched with black pepper gravy or half a bird on top of a sweet potato-bacon-cornbread waffle drizzled with maple bourbon syrup. Popular favorites also include swanky shrimp-n-grits with bourbon-cream pan gravy, hickory-smoked beef brisket with bourbon-peach juice, a “Two Fisted” burger with bourbon glaze, and a memory-making “Drunkin’ Bird” Kentucky coq au vin that smothers a bourbon-brined chicken breast with red wine-bacon gravy. 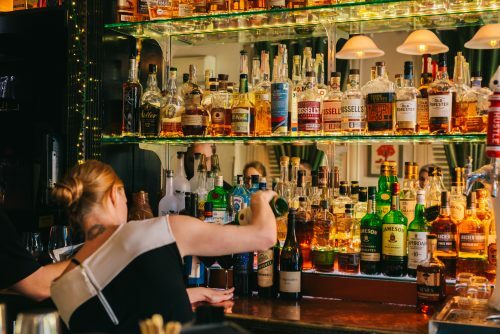 Bourbon is a steady ingredient in the kitchen, and of course the bar stocks an impressive selection. Purple Poulet is suitable for a special occasion, even if you simply feel like celebrating the fact that you’re doing The B-Line. Before you can cash in your The B-Line passport for free swag, you only need to visit two restaurants. But you may want to try them all since every menu entices. Our advice: Plan on multiple visits. You’re always welcome to The B-Line and Northern Kentucky. The B-Line also features distilleries and bars. Click the links to read more.